Can delete command use wildcards? you can delete commands begin keyword "no"
tired delete single file is ok but delete with error. see attachment. i've tried by typing but still with error. can cisco ios or packet tracer support wildcard to delete based on pattern instead of deleting individual files? 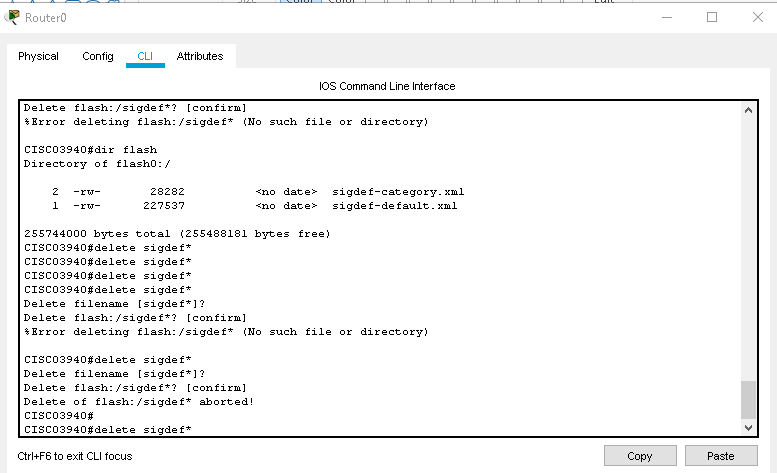 You are trying to delete in Packet tracer, not sure if it will work there, but in IOS it should work, but it will ask conformation for each file to be deleted (enter is enough to delete file).. Interesting, I did not notice so far that when files are deleted numbering of files in the second output stays the same.